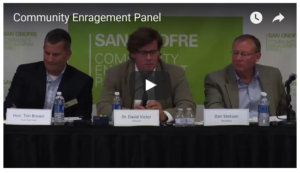 The San Onofre Community Engagement panel is a ratepayer-funded public relations effort by Southern California Edison. It is designed not to “engage” but to pacify the public and politicians into believing that Edison is a responsible, honest, law-abiding corporation that can be a trusted steward of its deadly radioactive waste from the San Onofre Nuclear Generating station known as SONGS. Get the video. Tell Governor Brown and the Coastal Commission to REVOKE Edison’s permit to bury nuclear waste on the beach! Having lived for several years within 50 miles of the Hanford Nuclear plant in Washington State, I can attest that the barrels mentioned for storage onsite at San Onofre are absolutely not safe. Hanford’s original barrels are now bursting underground and leaking on their way to the Columbia River with no solution in sight. We have the technology to end nuclear power for something better for future generations. Please help the state which you govern to end this.